To a standing ovation of law enforcement and government leaders, survivors of fallen officers and other supporters, Vice President Joe Biden accepted the 2009 Distinguished Service Award Monday evening from the National Law Enforcement Officers Memorial Fund. And he did so with characteristic humility, humor and honor for the profession that was honoring him. Unlike the NLEOMF’s Officer of the Month Award, which is given each month to a law enforcement professional who displays exemplary service or devotion to duty, the Distinguished Service Award is presented annually to “an individual or organization that has made an exceptional and lasting contribution to the law enforcement profession.” Past awardees have included Presidents George H.W. Bush and Bill Clinton, as well as the Police Unity Tour, DuPont, Motorola and Cynthia Brown, publisher of American Police Beat magazine. And, of course, laws establishing the National Law Enforcement Officers Memorial and the National Law Enforcement Museum. “For 16 years, he served as chairman or ranking member of the Senate Judiciary Committee. He helped craft virtually every major piece of crime legislation enacted during the last two decades,” the NLEOMF Chairman said. Having suffered the tragic and sudden loss of a loved one himself – just weeks after his 1972 election to the Senate, his wife, Neilia, and their 1-year old daughter, Naomi, were killed in an auto accident – Vice President Biden has always shown great compassion and concern for the surviving family members of the officers who have made the supreme sacrifice. He has attended the funerals and comforted the survivors of the fallen, and he has been especially supportive of the Delaware Chapter of the Concerns of Police Survivors, several of whose members attended the ceremony at the United States Capitol Visitor Center. Also attending was a “who’s who” of law enforcement and government leaders: U.S. Attorney General Eric Holder, Homeland Security Secretary Janet Napoletano, Drug Czar Gil Kerlikowske, and Michele Leonhart, Acting Administrator of the DEA. The Vice President paused to remember the three DEA agents who died in a helicopter crash earlier in the day during an anti-drug operation in Afghanistan, praising the DEA for its incredible work at home and abroad. Also on hand were members of Congress, including last year’s award recipient, House Majority Leader Steny Hoyer. The Vice President quipped that he couldn’t understand why his friend from Maryland received the award before he did. He also singled out the DuPont Company for its work in developing the Kevlar material for bullet-resistant vests, which have been credited with saving more than 3,000 law enforcement lives. “The first obligation we have – whether we’re talking about law enforcement or the military – is to give you everything you need to protect yourselves,” the Vice President said to the law enforcement officers in the auditorium. And he introduced his two sons who were in attendance: Beau, the attorney general of Delaware, and Hunter, a DC attorney. They had been seriously injured in the same auto accident that took the lives of their mother and sister 37 years ago. The Vice President said he was particularly proud to accept the Distinguished Service Award in front of his sons. The award itself is quite large, so Craig Floyd asked Colonel Robert Coupe, superintendent of the Delaware State Police, and U.S. Capitol Police Chief Philip Morse to assist in the presentation. Craig noted that those two agencies had played a special role in protecting the Vice President and his family during this nearly four decades of public service. On a cold and wet Sunday morning, nearly 600 runners converged upon the National Law Enforcement Officers Memorial to participate in the 2nd Annual Race to Remember, organized by the Metropolitan Police Department of Washington, DC, and benefitting the NLEOMF. Runners of all ages (under 10 to over 70) and from as far away as New Mexico, Texas, and Ohio completed the 5K course through the heart of the Nation’s Capital. Before the race, Memorial Fund Chairman -- and race participant -- Craig Floyd thanked the runners, not only for participating in the race, but also for their support of the Memorial and our efforts to build the National Law Enforcement Museum. MPD Chief Cathy Lanier, who participated with her “biggest loser” MPD team, spoke of the importance of remembering and honoring the sacrifice of all the fallen law enforcement officers. She expressed her gratitude for the Memorial, and her desire to see the race grow to over 1,000 runners next year. Joseph Persichini, Assistant Director in Charge of the FBI's Washington Field Office, and about two dozen members of the current 239th Session of the FBI National Academy in Quantico also ran (Joe finishing with a great time of 22:17). Special thanks to our generous race sponsors -- the Fraternal Order of Police Metropolitan Police Department Labor Committee and the Police Federal Credit Union -- and to supporters EAS Myoplex and GOSmart Pocket Pedometers by Omron, along with race partner Run Washington, for tracking all of the times and race results. The race would not have been possible without the efforts of the Fraternal Order of Police DC Lodge #1, Lodge President (and NLEOMF Board member) Marcello Muzatti and MPD Assistant Chief Patrick Burke (who joined his children in running the 5K course). And, of cousse, all of the volunteers who came out to help early on a Sunday morning. For Ginny Hill O’Branovich, Thursday was a day of memories. Her last words to her husband, Alexandria (VA) Police Corporal Charlie Hill, on March 22, 1989, upon learning he was headed to a hostage situation: “I love you and be safe.” The knock on her door hours later – an Alexandria Police lieutenant and her pastor on the other side. The groundbreaking of the National Law Enforcement Officers Memorial in 1989. The dedication ceremony two years later. The first time she saw Charlie’s name engraved on Panel 61-East, Line 5 of the Memorial. Their two sons, Charlie and Rob, did etchings that day. “I still have them,” she recalled. Thursday, Ginny joined other survivors of officers killed in the line of duty, along with law enforcement leaders and other supporters, at the Memorial in Washington, DC, for the 18th annual Wreathlaying Ceremony. Commemorating the anniversary of the Memorial’s dedication on October 15, 1991, Wreathlaying pays special tribute to officers from DC, Maryland, Virginia and federal law enforcement who have died in the performance of duty over the past 12 months. Two of those fallen heroes were special agents with the FBI: Sam Hicks and Paul Sorce. In his remarks, Joe Persichini, Assistant Director in Charge of the FBI’s Washington Field Office, said these two men, like all of the 18,661 officers whose names are inscribed on the Memorial walls, left behind a legacy of courage, compassion and commitment. “They answered the call to duty because they knew no higher calling. It is our solemn responsibility to finish the job they started and always honor and remember them,” he said. After the short speeches were done, Mrs. Hill O’Branovich and Mr. Persichini joined members of the United States Park Police Honor Guard in placing a wreath at the Memorial’s center medallion. Then, family members, friends and co-workers of the eight officers recognized at the ceremony placed roses there. With tears, hugs and salutes, they paused to remember and reflect on their loved ones. As the rain picked up again, Park Police Lieutenant Kathy Harasek played Taps, and retired DC Metropolitan Police Officer Chris Jackson offered a bagpipe solo – a poignant conclusion to a ceremony marking 18 years of the nation's monument to law enforcement service and sacrifice. May these and all fallen officers rest in peace, and may they always be remembered. Do you have a good law enforcement story to tell? Then Ed Nowicki wants to hear from you. Mr. Nowicki, part-time police officer in Twin Lakes (WI), law enforcement training expert and author, is looking for submissions for his new book, “American Blue.” It is a compilation of police stories from officers across the nation. All stories -- funny, weird, touching, dramatic -- are welcome for consideration. In addition to being part of this exciting project, authors will also be helping to build the first-ever National Law Enforcement Museum in Washington, DC. Mr. Nowicki has generously agreed to donate all royalties from “American Blue” to the Museum, set to open in 2013. To be a part of this project, please email Ed at NCJTC@aol.com. All stories should be submitted as an MS Word file. Please direct all questions to (262) 279-7879, and ask for the "American Blue Writer's Package." If your story is included in “American Blue,” you will receive one complimentary copy of the book upon publication. In addition to serving as a part-time officer in Twin Lakes, Mr. Nowicki is a nationally recognized use-of-force expert and executive director-emeritus of the International Law Enforcement Educators and Trainers Association (ILEETA). Mr. Nowicki's first book, "True Blue," is out of print after two printings. Motorcycles have been a part of American law enforcement for more than 100 years. And today, motor officers remain an extremely proud, skilled and generous group, as evidenced by a recent motorcycle rodeo in California. On October 7, 400 officers from 56 agencies competed in the Orange County Traffic Officer's Associaton's 37th Annual Motor Rodeo "Top Gun of Traffic Officers" contest. Eight cone courses resembling real-life scenarios tested officers' skills and abilities. Officers were automaticly disqualified for placing a foot down while riding or for knocking over a single cone. Deputy Brian Cline of the Riverside Sheriff Department was this year's "Top Gun of Traffic Officers." The annual event raisies money for officers injured or killed in the line of duty. The proceeds from this year are going to two critically injured police officers and their families in Orange County. In addition, the Orange County Traffic Officer's Association was able to donate $20,000 to the Oakland Police Association for the children of the four Oakland Police officers killed on March 21, 2009: Sergeants Mark Dunakin, Ervin Romans and Daniel Sakai, and Officer John Hege. For video and photos please visit, http://www.ocregister.com/articles/officers-event-spernak-2597468-county-ora. One hundred years ago, New York City Police Lieutenant Joseph Petrosino was assassinated in Palermo, Sicily, where he was investigating the Mano Nera – or Black Hand – organized crime syndicate that had been extorting protection money from business owners and residents in New York’s Little Italy. Lieutenant Petrosino is believed to be the first Italian-American law enforcement officer killed in the line of duty, and he remains the only member of the NYPD ever to die in a duty-related incident outside the United States. On Thursday morning in Washington, DC, under crisp blue skies, Italian government officials joined NLEOMF Board members, staff and supporters at the National Law Enforcement Officers Memorial to remember Lieutenant Petrosino and pay tribute to his service. NLEOMF Chairman and CEO Craig Floyd described Lieutenant Petrosino as a “tough, hard-working and very effective law enforcement professional” who set out on a mission of crime-fighting and delivered for his community. In early 1909, Lieutenant Petrosino set out on a secret mission to Sicily to collect evidence that would smash the Black Hand once and for all. On March 12, he planned to meet a man he thought was an informant. Instead, he was greeted by Mano Nera assassins who gunned him down. When his body was returned to New York City, the funeral procession lasted five-and-one-half hours and was attended by a crowd of more than a quarter million people – a richly deserved tribute to a true American hero. Representing the Region of Sicily was the Honorable Robert Leonardi, Director General for International Affairs. The President of Sicily, Raffaele Lombardo, was originally scheduled to attend the ceremony, along with Columbus Day events in New York City, but horrible flooding that has claimed more than two dozen lives in Sicily required that he stay home. At the conclusion of the remarks, Officer Marcello Muzzatti of the Metropolitan Police Department of Washington, DC, and the Fraternal Order of Police’s representative on the NLEOMF Board of Directors, joined Dr. Leonardi and two Embassy of Italy officials – Sebastiano Cardi, Deputy Chief of Mission, and Giannicola Sinisi, Counsular – in placing a wreath in memory of Lieutenant Petrosino at the Memorial’s central medallion. Then, the officials brought the wreath to Panel 56-East, where Lieutenant Petrosino’s name is engraved on Line 7. There, Dr. Leonardi and several other attendees, including members of the Order Sons of Italy in America and the National Italian American Foundation, completed etchings of Lieutenant Petrosino’s name as lasting reminders of his commitment, service and courage. The NLEOMF concluded another successful IACP Conference today. Foot traffic at our exhibit booth was a little lighter than the past two days, but remained remarkably strong. Staff really enjoyed seeing long-time friends and supporters and meeting so many new people, especially members of the Colorado law enforcement community who had a strong presence throughout the Conference. Kevin Morison, NLEOMF Senior Director of Communications, attended – or at least tried to attend – a workshop entitled “If You Only Knew What Your Body Language Was Saying.” Presented by well-known body language expert Janine Driver, the session was SRO by 7:45 am – 15 minutes before the official start time. 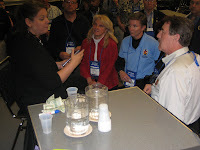 A former ATF agent, Janine has been presenting at IACP Conferences and PIO Section meetings for the past few years, and has been drawing a large and devoted following of law enforcement officials who appreciate her humorous and no-nonsense approach to dissecting their own body language and the messages sent by suspects. Kevin (and others) should remember to get there early for Janine’s presentations next year. Later in the day, Kevin Morison was interviewed by IACPtv, a video news team that has been gathering stories throughout the conference. Kevin provided an update on line-of-duty deaths in the United States (they’re down 7% this year and are on pace to break a five-decade low) and efforts to build the first-ever National Law Enforcement Museum. He reminded chiefs that the U.S. Department of Justice has authorized them to designate a portion of their federal Asset Forfeiture funds to support the Museum project. Chandler (AZ) Police Chief Sherry Kiyler recently directed some of her Asset Forfeiture funds to the Museum, making her the latest chief executive to do. 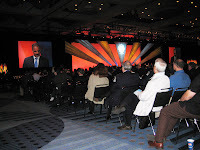 The IACPtv segments are shown at the Convention Center and in many of the host hotels for the IACP conference. They are also posted on the IACP website (Kevin’s segment is expected to be posted soon). The NLEOMF extends our thanks to the IACP Executive Director Dan Rosenblatt, officers and staff for putting together another extraordinary conference, and to the Denver Police Department and the city of Denver for being such gracious hosts. And special thanks, of course, to all of our friends and supporters who stopped by to thank NLEOMF staff for our work in honoring and remembering America’s law enforcement heroes. 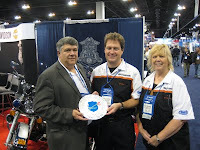 We’ll see all of you in Orlando, FL, for IACP 2010, October 23-27, 2010. It was another busy day at the IACP for the Memorial Fund. Chairman and CEO Craig Floyd and other NLEOMF staff started the day at the IACP/Motorola Webber Seavey Award for Quality in Law Enforcement breakfast. 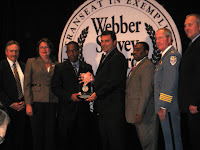 Twenty-five of the most innovative programs in law enforcement worldwide were recognized. Congratulations to all the awardees, especially the three winners: Richmond (VA) Police Department for GRIP – Gang Reduction and Intervention Program; Minneapolis (MN) Police Department for Juvenile Focused Policing: A Collaboration to Reduce Crime; and Ontario (Canada) Provincial Police for Provincial Traffic Safety Program. The First General Assembly featured speeches by leading federal law enforcement officials. Attorney Ge neral Eric Holder opened his remarks by remembering those officers who have made the ultimate sacrifice. “Together we have walked the Pathways of Remembrance and silently lighted candles at the [National] Law Enforcement Officers Memorial in honor of your 133 brothers and sisters who lost their lives in the line of duty last year.” The Attorney General was followed by FBI Director Robert Mueller and Department of Homeland Security Secretary Janet Napolitano, who, like Mr. Holder, spoke of the importance of federal-state-local cooperation in protecting both communities and fellow officers. 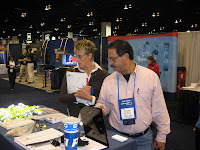 At the NLEOMF booth (#2607) in the exhibit hall, staff greeted hundreds more conference attendees. A number of chiefs inquired about how they might be able to use some of their federal Asset Forfeiture funds to support the National Law Enforcement Museum. Last year, the U.S. Department of Justice ruled that the Museum was an allowable use of Asset Forfeiture funds. The NLEOMF recently sent information to chiefs encouraging them to consider devoting some of the funds to the Museum project and to visit the NLEOMF booth to learn more. Later in the day, NLEOMF staff visited with many of the generous corporate partners who have supported the Memorial Fund and the Museum over the past year. As strong supporters of the law enforcement community in general, the corporations are also exhibiting at the IACP Conference. The 116th Annual Conference and Exposition of the International Association of Chiefs of Police got into full swing today. At 10 am, the exhibit hall at the Colorado Convention Center officially opened. More than 700 companies, government agencies and other organizations are displaying the products and services this year. Traffic was brisk at the NLEOMF’s booth (#2607). Our 25th Anniversary lapel pins were especially popular. 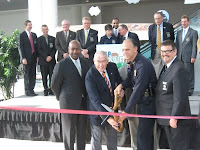 Many people inquired about National Police Week 2010 (it runs from May 9-15) and the status of the National Law Enforcement Museum (groundbreaking scheduled for the fall of 2010 and opening in 2013). And several told poignant stories of their connection to the Memorial and visits they have made there. NLEOMF staff will be greeting conference attendees at the exhibit booth for the next two days. The Police Executive Research Forum (an NLEOMF Board member organization) held its Town Hall Meeting this afternoon. Moderated by PERF Executive Director Chuck Wexler, this free-form discussion touched on a number of topics. NLEOMF Chairman and CEO Craig Floyd gave an update on law enforcement officer fatalities (they’re down again this year, after reaching a near five-decade low in 2008), and he provided an update on the Museum project, reminding the chiefs in attendance that the U.S. Department of Justice has authorized local and state agencies to designated some of their federal asset forfeiture funds to the Museum campaign. Also that afternoon, NLEOMF Communications Director Kevin Morison and Lynn Lyons-Wynne, Senior Director of Memorial Program, facilitated a training workshop entitled “Is Your Department Making the Most of National Police Week?” They were joined on the panel by Eriks Gabliks, Deputy Director of the Oregon Department of Public Safety Standards and Training, who oversees that state’s law enforcement memorial. The workshop covered National Police Week events and opportunities in Washington, DC, and in local communities. And while it may not have been the largest workshop of the day, it inspired an interesting dialogue on how agencies can work with the NLEOMF to honor their fallen heroes each May. That night, American Police Beat magazine hosted its annual reception in support of the National Law Enforcement Museum, in conjunction with the Colorado Association of Chief of Police and the Denver Police Department. 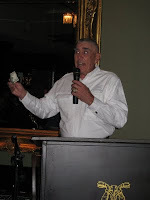 Gunny R. Lee Ermey, the Marine who went on to star in Full Metal Jacket and other films, fired up the crowd at the historic Baur’s Ristorante on Curtis Street. And emcee Rikki Klieman and Craig Floyd made the case for supporting the Museum campaign. Generous sponsors of the event were Deloitte, Elbeco, Glock, LexisNexis, and Ted Hunt and Associates. Our sincere thanks to all who attended, and especially the people made donations on the spot to help make the Museum a reality. The National Law Enforcement Officers Memorial Fund is excited to announce the launch of WILL ALWAYS REMEMBER, our online photo tribute campaign. This campaign encourages Americans to show their support for the men and women of law enforcement, in particular, those who have died in the line of duty. Over the years, 18,661 names have been engraved on the walls of the National Law Enforcement Officers Memorial, and they will always be remembered by their families, friends, partners, and communities. WILL ALWAYS REMEMBER is a new and creative way to show your appreciation for these American heroes. It’s easy to participate in the campaign. Simply download a WILL ALWAYS REMEMBER sign by visiting http://www.willalwaysremember.org/, then fill in your name and message. Be creative with your sign and picture. Take your picture holding the sign (or have someone take it for you). Upload your picture to the website. Or, if you are already a Flickr user, upload your own photo by joining the WILL ALWAYS REMEMBER group and add your photo to the group photo pool. Make sure to check back to http://www.willalwaysremember.org/ to view others’ pictures and look for yours in the slideshow. As an added element to this campaign, viewers will be able to cast one vote for their favorite user-submitted picture. The voting period will run during the month of March (March 1-31, 2010). The person who submits the photo that receives the most votes will win a trip to DC for National Police Week 2010 to attend the Candlelight Vigil. The winner will receive one round-trip airfare to DC and lodging for two nights along with VIP seating at the Vigil. The winning photo will be announced April 5, 2010. So make your sign and take your picture today. Show your support for the entire law enforcement community and your appreciation for the hard work, dedication, and personal sacrifices our officers make every day.